7 A precursor to a modern 'date night'? 2 second-year students of Bideford School of Art have replaced stained glass windows in the gate house of the 15th century Weare Giffard Hall which had been vandalised some years ago. 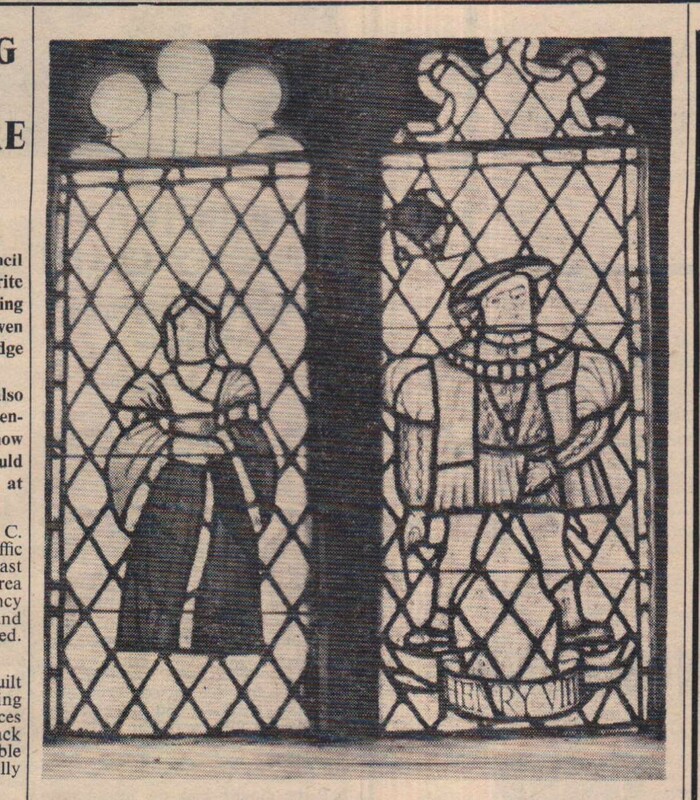 There are 4 windows set in pairs – the picture above details Henry VIII and Ann of Cleves. Weare Giffard Hall is being restored by Miss E M Mullins, Mrs M Minett and Mr and Mrs H M Dickinson who bought it 12 months ago. This picture and article appeared in the Gazette on 2 February 1968. 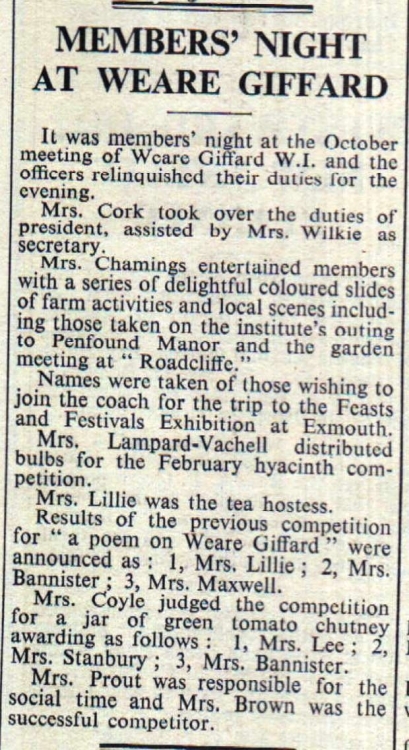 Members of Weare Giffard and Landcross W.I. were entertained by Miss D Luard who gave a talk and showed slides about her visit to Australia. She was thanked by Mrs Bannister. The competition - scotch eggs - resulted: 1. Mrs Bannister; 2. Mrs Chamings. A new member, Mrs Moore, was welcomed. Captain Frederick John Gayette, formerly of Myrtle Street, Appledore, who has died, at the age of 93, went to sea at the age of 10. He had travelled all over the world in sailing and steamships, and served on Merchant Navy ships in the Boer Wars. One of his ships was torpedoed in the First World War and another, the Shoal Fisher, was sunk by bombs in teh World War 2. He then served in the Admiralty in the Torridge estuary. For his services he was appointed M.B.E. Mrs Beatrice Mary Braunton of April Cottage, Weare Giffard, who died at the age of 82 was the widow of Mr Frank Braunton. The funeral took place at Holy Trinity Church, Weare Giffard. The last time reed-threshing was seen in the village of Weare Giffard was about 30 years ago, and it could be another 30 years before it is seen again. It was members’ night at the October meeting of Weare Giffard WI and the officers relinquished their duties for the evening. Mrs Cork took over the duties of the President, assisted by Mrs Wilkie as secretary. Mrs Chamings entertained members with a series of delightful coloured slides. Mrs Lampard-Vachell distributed bulbs for the February hyacinth competition. Mrs Lillie was the tea hostess. A precursor to a modern 'date night'? Baby sitters and refreshments provided. Husband and wife only – that was the strict ruling for those attending a Christmas and New Year social at Weare Giffard Parish Hall on Thursday week. The social was the second annual event of its kind at Weare Giffard and is an experiment being carried out by the rector and his wife, the Rev and Mrs J M Lucas. Here are some of the 130 Brownies who attended the Brownie Revels, held at Weare Giffard on Friday. Brownies came from four Bideford packs, and packs at Appledore, Northam and Alwington, as well as Weare Giffard. The event was organised by the Rector of Weare Giffard, the Rev J M Lucas, and Miss P Durant. During the warm, sunny evening Brownies enjoyed races, games, a treasure hunt and refreshments. Much sympathy and kindness have been shown to the family of the late Mrs Banbrook, who passed away suddenly. Mrs Banbrook was the widow of Mr John Banbrook who died six years ago. Deceased was highly respected, and beloved by all who knew her. Many relatives and friends attended the wedding at Holy Trinity Church, Weare Giffard, on August 4th, of Mr Walter Douglas Redclift, second son of Mr William Redclift and the late Mrs Redclift, of Hartland Mill, and Miss Phyllis Mary Evans, eldest daughter of Mr and Mrs Walter Evans, of Quay Cottage, Weare Giffard. The wedding service was fully choral and was conducted by the Rector of Weare Giffard, Rev G C F Edwards. The organist was Mrs L A Edwards. Weare Giffard Parochial Church Council has decided to proceed with a scheme for re-hanging and re-tuning the Church’s peals of six bells. The estimated cost of the work, which it is hoped will be finished by Christmas 1951, will be £637. This is a very heavy burden for the Church to bear by itself and it is hoped that the villagers of all denominations will concern themselves in this improvement to their historical church, so that the bells may once more ring in perfect harmony. The bridgegroom, Mr Terry William Dymond, eldest son of Mr and Mrs W Dymond, 3 Church View, Weare Giffard, plays skittles for a village team. The bride, Miss Linda Susan Kitto, is the eldest daughter of Mr and Mrs D F Kitto, 3 Glebe Houses, Abbotsham. Bridesmaids were Julie, the bride's sister, Vanessa, the bridgegroom's sister and Beverly and Rebecca Williams, cousins of the bride. Mr Michael Randell was best man and the ushers were the bride's brother, Bryan, the bridegroom's brother Roger and the bridegroom's brother-in-law, Mr Ivor Dennis. The 15th century Manor House of Weare Giffard Hall, with 3 1/2 acres of land and half a mile of fishing in the River Torridge was sold by public auction on Friday £11,300. Joint purchasers were Miss E Mullins of Ealing, London, and Mr and Mrs Maurice Dickinson, of the Post Office, High Street, Clovelly. Miss Mullins is Mrs Dickinson's aunt.